Nkarta Therapeutics is a privately held biotechnology company focused on the discovery and development of engineered natural killer (“NK”) cells for treating blood cancers and solid tumors. We have an industry-leading platform to harness the power of NK cells to create off-the-shelf therapies. We expect to have multiple programs in proof-of-concept clinical trials in 2020. Our investors include NEA, Novo and SR One. We are seeking a highly motivated Vice President of Finance to create, lead and build our internal Finance department in a fast-growing environment. The position is responsible for financial reporting, FP&A, accounts payable, payroll, treasury, tax, and internal controls. This position reports to the Chief Financial Officer. The successful candidate will be a seasoned financial executive who has a detailed understanding of how a company’s resources can (and should) be used to achieve its strategic goals. This individual will excel at reporting financial information in a clear and concise way, and is adept at financial modeling. Public-company experience will be relevant as Nkarta grows. 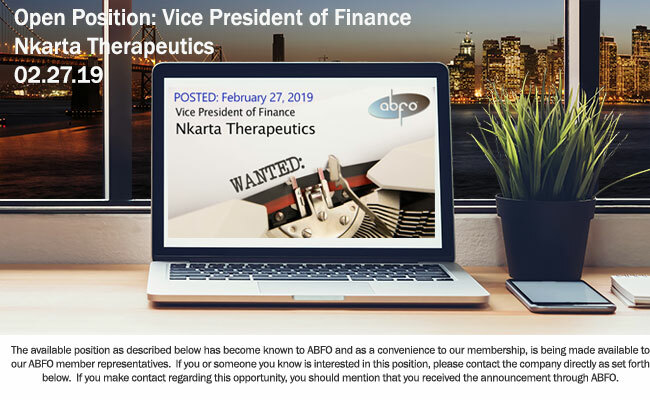 Finally, a passion for science and medicine, combined with industry experience, will allow the VP Finance to thrive in our fast-paced, diverse and cross-functional work environment. While we are a relatively small company today (~26 employees, nearly all R&D), we are planning for substantial growth, and the VP Finance will be a key player in setting up Nkarta for future success. The ideal candidate will initially be able to dig in on a “hands-on” basis and transition to more of a leadership role in the near term, as the Finance function is built out in parallel with Nkarta’s growth.